What wine should you pair with red meat? One of our guests recently scolded me for this. He had chosen the fillet steak from our Menu de Luxe, and couldn’t decide which wine to accompany it. “Of course, if you wrote a blog about wines and red meats instead of wines and fish, which I never eat, I wouldn’t have this trouble!” he told me. So here it is. 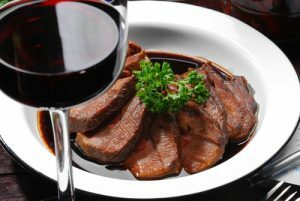 A blog to describe which types of red wine you should select to go with your red meat when you dine out in Torrevieja. If you are eating leaner cuts of steak or beef – for example, sirloin or roast beef – you should opt for lighter or medium-bodied reds. Match the intensity of the beef with the intensity of the wine. For example, if you are eating a beef bourguignon or stew prepared with top sirloin, treat yourself to a bolder medium like Sangiovese. Fattier cuts work better with bolder reds with higher tannin levels. The tannin ‘scrapes’ the fat from the inside of your mouth, helping that taste explosion with every forkful. If you are eating filet mignon, skirt steak, or ribeye, pair it with a Barolo or Cabernet. The more delicate flavour of lamb deserves a lighter red. If you are accompanying your lamb with a sauce, you should also consider this in your wine choice. Follow the sauce with the wine in this case, and perhaps select a medium-bodied red with a smoother tannin. Examples might include Malbec, Syrah, and Verdot. Fancy a white wine or rosé with a red meat? Veal is perfect for this combination. The meat’s delicate flavour is enhanced by the method of cooking, so also ask about this and, as with lamb, think about the sauce, too. 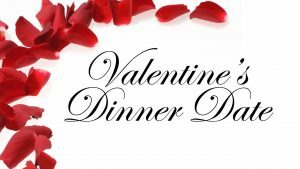 Great pairings with veal include Pinot Noir, Valpolicella, and Zinfandel. Venison is always popular when our chef prepares it. It’s not a constant on our menu because we must be sure that when it is available it is of exceptional quality. 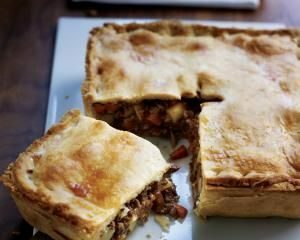 From time to time we may offer a venison steak or a homemade venison pie. Complement the rich, gamey flavour of venison with a more rustic, medium-bodied red wine. This provides a fruity backdrop to the meat, and reduces that gaminess. 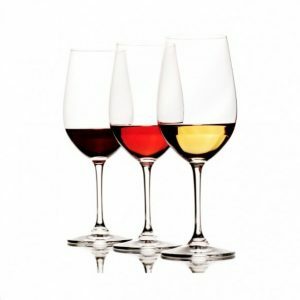 Think Côtes du Rhône, Chianti, and Valpolicella. 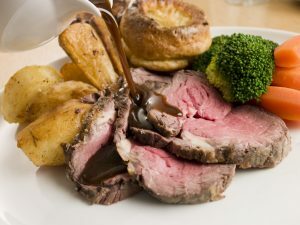 How do you find a great Sunday lunch in Torrevieja? Sunday. Traditionally the day of rest. The last thing you want to do, whether you’re an expat living on the Orihuela Costa or a holidaymaker here, is slave over a hot oven to prepare your Sunday lunch. Why put that apron on to peel potatoes and baste the bird? And all that washing up after? Surely your Sunday shouldn’t be such a bore and a chore? Where can you find magical music and delectable dinner in Torrevieja? 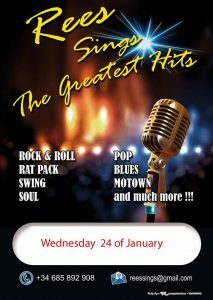 It can be difficult to find a single venue where you can enjoy live music and fine dining together in Torrevieja. Often, this means you must rush your dinner, and then travel on to another venue to sate your appetite for a spot of music and dancing. Here at Christopher’s Restaurant, we’re known for the quality of the food we serve and our award-winning front of house service (Costa Blanca People Culinary Awards 2016). By popular demand, once a month this year, we’re extending our menu to include live music, allowing our guests to enjoy memorable music in the relaxed atmosphere of their favourite restaurant. What do those allergen symbols mean on restaurant menus? On our new Restaurante Christopher’s menu, you’ll notice that we’ve included new allergy symbols. Most are straightforward to understand – a picture of a nut, or a milk bottle, an ear of wheat, a fish… and so on. If you aren’t sure which applies to you, we’ve included descriptions in our menu. 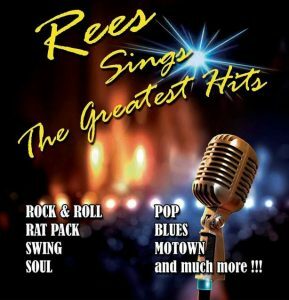 We’ve got a fantastic new menu for diners at Christopher’s for spring and summer 2018, and we’re showcasing it on Wednesday 28th March, when we also welcome back Rees to entertain guests as we provide another evening of fine dining and magical music. We’ve listened to people who dine with us and switched things up a bit. Our new menu retains many of the dishes that have become favourites with our guests, and includes some new additions. 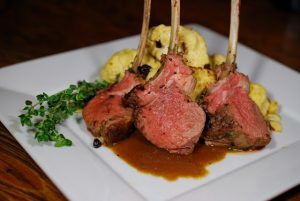 We’ll still add in the occasional special, when we can source premium quality meat, poultry, game, and fish. The big change we’ve made is in how you choose your menu. Gone is the individual pricing, per course and per dish. 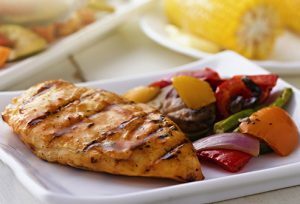 Now you choose between three menus, each offering superb value. How to choose your wine for dinner: choose the sauce first! As we’re in the second week of National Sauce Month, I thought I’d write about how to choose your wine for the sauce accompanying your meal. You see, most people select the wine based upon the type of meat or fish they are eating. Considering the sauce first puts a refreshing spin on making your wine selection. Why do chefs add sauces to restaurant dishes? Why sauces are added to food is a question that I get asked regularly. Of course, there are those who have their favourite sauce with everything. It’s not uncommon for kids to smother both meat and vegetables with tomato sauce – even their baked beans! Then there are those who prefer their food without the sauce. I wouldn’t want to tell you how to take your food, but those at either end of the spectrum may be missing out on a taste sensation. But it’s not only to complement flavours that we add sauces. March is National Sauce Month in the United States, which got me thinking – just how many sauces are there? The answer is hundreds, if not thousands. A great sauce takes any food to another level. Think about it, and you’ll realise that you know at least one person who has a certain sauce with practically every food they eat. Yep, a sauce is often the key that unlocks the real flavour of our food. Yet, most people don’t make their own sauces. It’s so easy to buy a ready-made sauce from the supermarket, or a packet to which you simply add water, that we’re losing the art of making sauces at home. In this post, I’ll take a quick look at what are called the five mother sauces – from which most hot sauces are derived. First, let’s define what a sauce is. Sauces can either be hot or cold, and served with savoury or sweet dishes. It could quite reasonably be argued that sauces include salsas, dressings, coulis, salad dressings, chutneys, and so on. 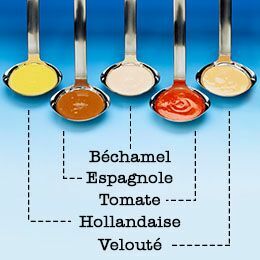 Three are five basic sauces, each of which are now created using French culinary methods. The French do like a bit of sauce. Most other sauces are created using one of these five mother sauces as a base. So, what are they? Each of these sauces can be used on its own as an accompanying sauce. 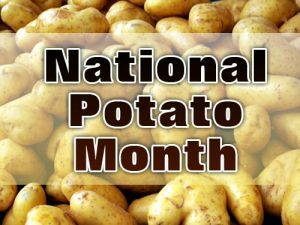 However, by adding other ingredients, you can create any number of other sauces to suit different foods and individual tastes. These mother sauces are extremely versatile, and are used as pseudo-ingredients themselves. For example, let’s take béchamel, a sauce that is a key ingredient in lasagne and macaroni cheese. Also, it’s a sauce that is the foundation of cream sauces, such as Alfredo sauce. And if you take hollandaise sauce and add vinegar, herbs, and shallots… Voila! Béarnaise sauce. Unfortunately, in many restaurants you no longer hear the classic sauce names. Perhaps this is a symptom of losing the ability to create sauces at home. 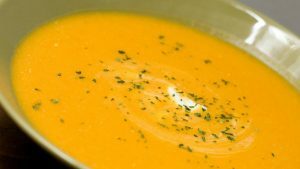 Instead of béchamel, you’ll find that menus offer a white or cream sauce; espagnole has become demi-glace; hollandaise is a butter sauce; velouté is a blonde sauce; and, perhaps the worst of all, tomato has become red sauce. Next time you’re in the kitchen, why not make your own sauce? Have a little fun and eat more healthily in the process. 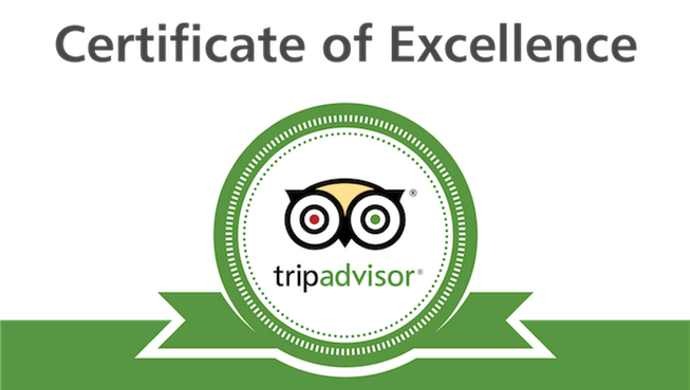 For a great dinner in one of the top ten restaurants in Torrevieja (as reviewed on TripAdvisor), call us on (+34) 600 01 28 24. 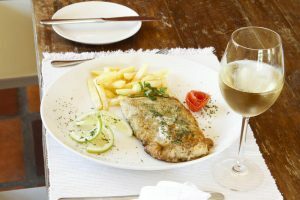 What wine should you pair with fish when dining in a Torrevieja restaurant? If you’re eating healthily when you dine out, you may choose to have one of our flavourful fish dishes rather than meat. Just because you are eating fish, you don’t have to stick to the standby of Chardonnay as the accompanying wine. These wine and fish pairings may take you out of your comfort zone and away from your regular choice of wine. 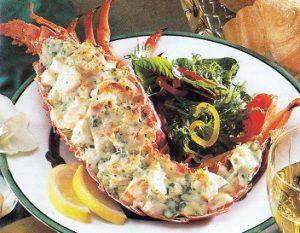 They will also enhance your experience, delighting your taste buds as the flavours of the wine and fish explode in your mouth. One of the best restaurants in Torrevieja is 1 year old! Christopher’s Restaurant is one year old on March 1st 2018. “One year old?” I hear you ask. “But hasn’t it got a reputation as one of Torrevieja’s best restaurants that stretches back more than 10 years?” you ponder. Is there a better way to round off a terrific winter evening out (or in) than with a warm and comforting liquor coffee? If there is, I’ve yet to find it. If it’s the weather to start a fine three-course treat with a wholesome, homemade soup, it’s the weather for a cracking Irish coffee to end. 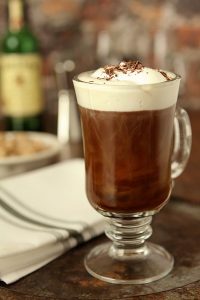 In this post, I’m going to show you how to make the perfect Irish coffee. The Christmas and New Year period is a great time for families. It’s also a fantastic opportunity to spend time with friends. 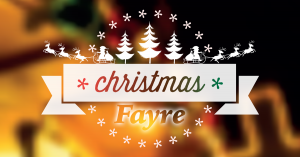 What better way than to enjoy a pre-Christmas dinner at a fine dining restaurant? The couple of hours you spend together as a group is better than any present under the tree. Recall your best memories from the last 12 months. Reminisce about those who are no longer with us. 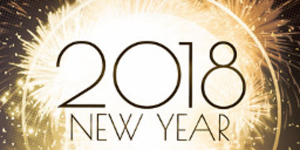 Chat about your big plans for next year. In a nutshell, eat, drink, and be merry! Unfortunately, group dinners (or lunches) can also run into roadblocks. The restaurant doesn’t have space for those two additional guests you invited a couple of days ago. There’s a problem when splitting the bill. The service wasn’t quite what you expected. 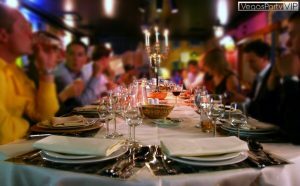 Here’s a few restaurant etiquette tips to help you avoid such problems when you dine with a big group. As the holiday season approaches, Orihuela Costa’s best companies are treating their staff (and best customers) to a Christmas lunch or dinner. It’s the perfect way to say thanks for their dedication, service, and loyalty during the last 12 months. And it doesn’t have to break the bank, either.